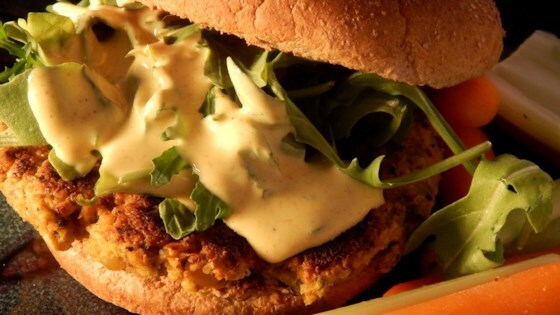 "We love all kinds of veggie burgers, but this is one of our favorites. Bulgur can be substituted for the quinoa if desired." Bring water and quinoa to a boil in a saucepan. Reduce heat to medium-low, cover, and simmer until quinoa is tender and water has been absorbed, 15 to 20 minutes. Process carrot in food processor until roughly chopped; add quinoa, garbanzo beans, green onions, bread crumbs, egg, garlic, and cumin. Pulse quinoa mixture until just mixed; transfer to a bowl. Stir peas and corn into the quinoa mixture; refrigerate until mixture comes together, about 15 minutes. Form quinoa mixture into patties. Heat olive oil in a skillet over medium heat; fry patties until golden brown, 4 to 5 minutes per side. Stir yogurt, tahini, lemon juice, cilantro, and curry powder together in a bowl. Serve burgers with tahini sauce. I left out the tahini sauce and used thai satay sauce instead. The burger itself was had a sweet taste and went well with the satay sauce. was a good veggie burger and texture but had a very, very bland taste and needed too much salt and pepper.